I have chosen to cover this subject, only because I am so surprised at how often I get asked this question, “Is one color better than another, temperament-wise”…or I get the statement, ” I hear all chocolates are hyper”, or ,” My Uncle Barney says, all yellows are mellow”…well, lets talk science instead of “wives tales”, ok…. It almost reminds me of the statement I heard once that “I think all LARGE labs are calmer”…talk about “bad science”…its not even logical. Its all GENETICS…believe me, I could show you over 50 LARGE (100 lb +) American field labs that are the most hyper, most obnoxious dogs I have ever made contact with. Right there, you see the logic and where this goes… Regarding color, it’s like saying “all blondes (human) are dumb, and all redheads have a bad temper”…well, you can see the absurdity of that statement. So I will let you draw your conclusion about color…its ALL genetics. You cannot even go from “experience”, I will admit you have probably seen a lot of terribly hyper chocolate labs, I have seen terribly hyper labs both black, chocolate, and yellow. Remember, labradors are the most popular dog in the US, and everyone and their brother can breed a litter of labs and sell them (with no regard to temperament, genetic soundness, nor conformation)…and that produces irresponsibility in breeding, so you will see more POORLY bred labs than any other breed, for this reason. Chocolates, being the rarest in the breed, are more often bred for coat color alone, which is why you may see more poorly bred ones in your travels. 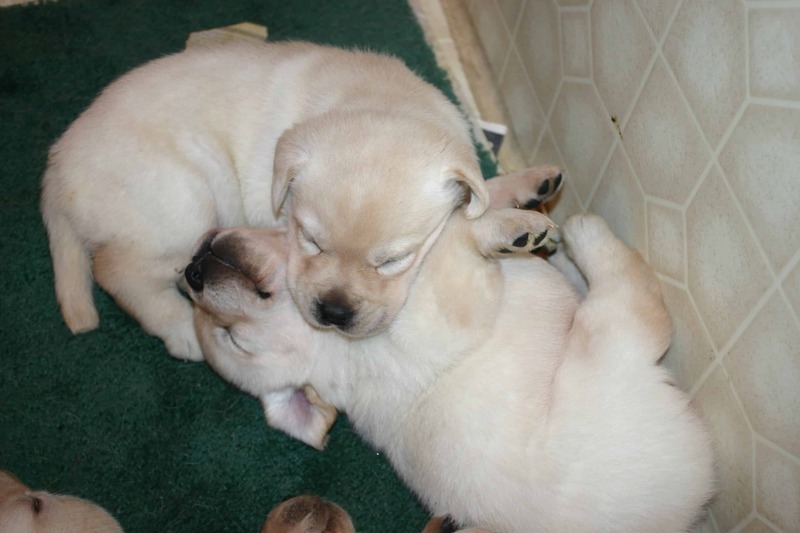 We breed for good temperament, proper conformation, and genetic soundness in ALL or our labs, no matter what color. And concerning chocolates, I once had an AKC show judge once tell one of my clients, “don’t buy a chocolate from any breeder in the US other than Endless Mt. Labradors, or Erinhill Labradors.” Interesting…. I am interested in a puppy. How much would one cost? 10 years old with a Beagle..I could not believe what he had that dog doing. He told me he had been watching us train dogs and just imitated what we did. Just takes time. teach them almost anything…I am amazed at what some dogs learn. Just never give up…repetition is the key…. 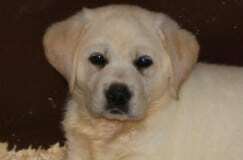 I am very interested in breeding labs in Montana and am looking to you for the best and most beautiful labs in the business. Is this something you can help me with? 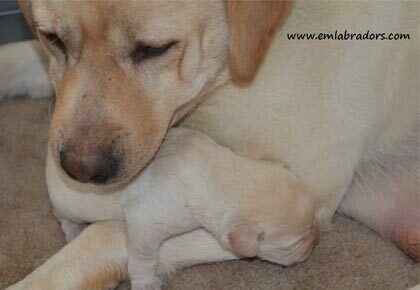 So sorry for your loss… 🙁 Email us at bestinshow@emlabradors.com and we can talk about upcoming litters. I love this! I have started raising/showing English Labradors and I deal with this all the time of people asking what’s differen’t about the colors…nothing? Besides the color and the genetics behind them. I personally don’t care for Chocolates but not because they’re “crazy” I always love what you have to say about the breed, Thanks for posting this! People are so funny about what they will say about a person’s dog…I have a chocolate English lab who is the sweetest, most mellow dog ever! Because of his blocky, English head and shorter legs, I have had people ask if he is a pit bull, a mastiff, etc., etc. – um, no!! I love your common sense posts about the breed and love seeing your pics on my Facebook feed! because of his big block head. I once had a trainer tell me my chocolate lab will never learn anything. That all chocolates have a gene in them from one from years ago that was crazy. I never went back to her. My chocolate girl isn’t from Endless Mountain, but she is beautiful and pretty darn smart. Thanks for the article. Judi, that is the craziest thing I’ve ever heard! Haha! Glad you switched trainers! I saw your post on Facebook and I was like here we go again…. I wondered if you would bring up the never breed a chocolate with a yellow… And you did… Quite impressed…. One always need to look at the DNA of the dog one is purchasing…. Too many people just breed for money…. I gave up breeding because of that…. They are far too special for that…. I too loved seeing the pigment talk in this. I wish more people would STOP breeding for dudleys and ruining the yellow gens with chocolate. It’s very hard to find a well bred yellow now day with correct pigment and no chocolate. People try pulling it off as “rare”…really? My Dudley is the most well behaved dog I’ve ever met we’ve had people ask to buy her many times. Dudley’s arent bad dogs! They are the best if you ask me. My lab is a Dudley and she has never harmed a soul in her life. I would be proud of any pup she had regardless of the pigment. Dudley’s beat normal Labradors by a long shot in my book! I know, but just think of the massive amount of traffic and exposure your site might receive if it hits the first page?Something to ponder, although I suppose Digg checks IP addresses to counter this. “Ruining the yellow gene with chocolate” is a pretty screwed up statement. Intelligent and the MOST LOVING girl I’ve ever had. I wouldn’t trade her for another even if given the opportunity! I know it’s not the “preferred” genetic match, but she’s perfect in mine and my families’ eyes and hearts. I am curious why Canine Companions for Independence, who is known worldwide for breeding their Service dogs for temperament, never have chocolate labs? They have yellow and black and they have Labs and Golden Retrievers and they cross breed some Labs with Goldens, but they never use chocolates…why is this? I was wondering what is the difference between american bred and english bred labs? 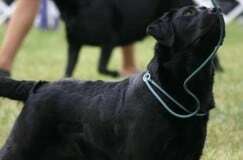 The English in known for show work and to have bigger blocker build,, where as the American Labs where bred for sport. Therefore there more lean, and agile then the English. Ive seen people us the English for a gun dog but there a bit more bulkier in most hunting lab owners minds. We’ve always stuck to the Americans due to the longer leaner frame in my family. Many years ago I owned a Black Lab who was my sweetie. He has been gone for many years now. I rescued a chocolate Lab about a year ago when she was about 7 weeks. She is now 15 months old. From reading your article Im am pretty sure she is a mix of yellow and chocolate Lab. But I have to tell you , she is the most beautiful caramel color with lite splotches of gold. She is definitely hyper but also very smart. I wouldnt want any other dog. I agree with the thought that each dog has its own personality ALONG with the inherent traits of the breed. I would definitely recommend Any Labs to those who want a loving but active dogs. 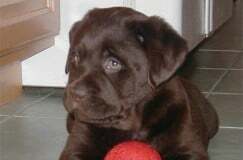 I had an English lab (that is what the breeder called him) with a big block head and thick, dark chocolate fur. He was a typical puppy for about 3 years (lol) but turned out to be the best dog I have ever had. I lost him last October after 13.5 wonderful years. He is and will always be my ‘bestest buddy’. I now have 2 smaller chocolate labs from a rescue and from a ‘shelter’. I don’t think they are pure breed labs but they are still beautiful. Labs, especially the chocolate ones, will always be my favorite breed of dog. I have a yellow lab mix and she has the pink nose and hazel eyes. We got her from friends that had a chocolate lab that had pups with the neighbors border collie. Is there health problems related to the pink nose? I absolutely adore my “Mia” and don’t want any health problems if they can be avoided. No health problems whatsoever Leslie! 🙂 As was said above, it’s merely not the proper pigment color by conformation standard. It doesn’t mean at all that you shouldn’t have a healthy, happy labby! Our family has a “Dudley” (yellow lab with pink nose and light eyes) and she’s a wonderful dog. Smart, caring, loyal and just a beautiful family member. Why is it you frown upon this? I am not a breeder, just a very passionate dog lover. The frowning is from a breeding perspective, not from an owner’s perspective. While the dog itself can be a wonderful loving family member, genetically for color preservation, a dudley lab is not a properly bred lab. Really wish more emphasis was placed on temperament than nose color (infinitely more important) but…because Labrador colouration is controlled by multiple genes, it is possible for recessive genes to emerge some generations later and also there can sometimes be unexpected pigmentation effects to different parts of the body. Pigmentation effects appear in regard to yellow Labradors, and sometimes chocolate, and hence the majority of this section covers pigmentation within the yellow Labrador. The most common places where pigmentation is visible are the nose, lips, gums, feet, tail, and the rims of the eyes, which may be black, brown, light yellow-brown (“liver”, caused by having two genes for chocolate), or several other colours. 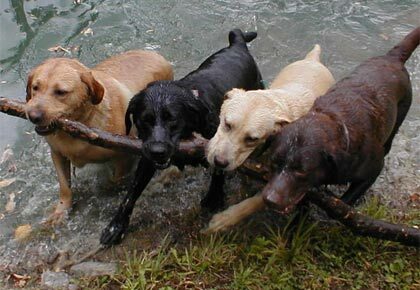 A Labrador can carry genes for a different colour, for example a black Labrador can carry recessive chocolate and yellow genes, and a yellow Labrador can carry recessive genes for the other two colours. DNA testing can reveal some aspects of these. Less common pigmentations (other than pink) are a fault, not a disqualification, and hence such dogs are still permitted to be shown. The intensity of black pigment on yellow Labradors is controlled by a separate gene independent of the fur colouring. 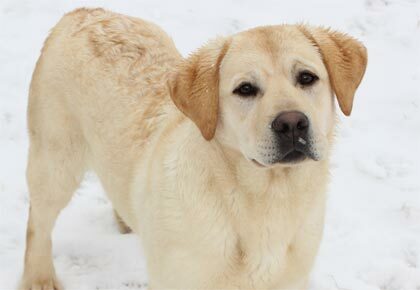 Yellow Labradors usually have black noses, which may gradually turn pink with age (called “snow nose” or “winter nose”). This is due to a reduction in the enzyme tyrosinase which indirectly controls the production of melanin, a dark colouring. Tyrosinase is temperature dependent—hence light colouration can be seasonal, due to cold weather—and is less produced with increasing age two years old onwards. As a result, the nose colour of most yellow Labradors becomes a somewhat pink shade as they grow older. A colouration known as “Dudley” is also possible. 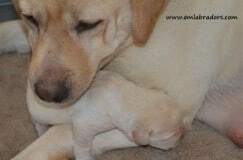 Dudleys are variously defined as yellow Labradors which have unpigmented (pink) noses (LRC), yellow with liver/chocolate pigmentation (AKC), or “flesh coloured” in addition to having the same colour around the rims of the eye, rather than having black or dark brown pigmentation. A yellow Labrador with brown or chocolate pigmentation, for example, a brown or chocolate nose, is not necessarily a Dudley, though according to the AKC’s current standard it would be if it has chocolate rims around the eyes (or more accurately of the genotype eebb). Breed standards for Labradors considers a true Dudley to be a disqualifying feature in a conformation show Lab, such as one with a thoroughly pink nose or one lacking in any pigment along with flesh coloured rims around the eyes. True Dudleys are extremely rare. Breeding in order to correct pigmentation often lacks dependability. Because colour is determined by many genes, some of which are recessive, crossbreeding a pigmentation non-standard yellow Labrador to a black Labrador may not correct the matter or prevent future generations carrying the same recessive genes. For similar reasons, crossbreeding chocolate to yellow Labradors is also often avoided. Well I have a yellow lab that was accidentally breed with a chocolate lab and she has the pigment of the chocolate around her eyes and nose and her belly is the sweetest pink! I love her dearly and she is so beautiful there is not a place i go with her that i am not stopped and told how beautiful she is and well behaved ….. I love your sight and i follow your post but i take great offense to your comment about my lab being a NO NO!!! I agree with sweet! Dudley’s are the best Labs in the world my dog Amanda has never growled in her life well aside from threatening a chew toy. She is the smartest dog I’ve ever seen she puts border collies to shame. She teases my brother and in 15 years that tail hasn’t stopped once. She even broke her tail wagging it to much. Our vet says shes almost to happy. We boarded her up one week at our vets to go on vacation. When we came back the vet looked straight at us and said your dog is to damn happy. She had beaten her tail hairless bloody and raw against the side of the kennel and then beat the bandages off 4 times. When we came to get her she beat the 5th bandage off and had to get a 6th one put on and that one didnt even last till we got home. Thank you, Also have male dudley. Your experience is also mine! Great dog. Why is the dudley color not recognized? It’s purebred! It is known that it happens with a yellow and a choclate. There are no known health risks. So what’s the deal with it being a conformation issue? I think they are the most beautiful labs! I really wanted a Chocolate female to breed mine with, which i now know is a “no no”. But if both dogs are papered, registered, healthy, and great natured, and/or good hunters, why would they not be desireable? I really dont get it! And the whole color discrimintation issue cracks me! It may not be truely true, but there are some accidental truths to it! My first papered lab was a yellow..dumb as a rock, horrible temperment. Was snippy and mean as a pup. But gorgeous. My grandmother(as I was a kid at the time) made me give her back to the breeder. My next one was a freebie mutt. Black lab and Australian shepherd mix. Obnoxious as all get out, smart as a whip with a mind of her own! My next freebie mutt was a yellow lab/golden retreiver mix. Sweet as pie, and really very mellow for a lab. Wasn’t a chewer like my black one. Listened fairly well, just wasnt good with male dogs or strange people. Now my new baby, he is clearly a dudley, and he is registered and papered! Smart smart dog! VERY mellow for a lab, but he also has a great temperment! He needs a little more socalization so he doesn’t get all weirded out by people like my black one and my previous yellow lab. I really wanted a chocolate… which now my heart is kinda broken! Or “silver”. My personal opinion, which clearly doesnt matter, is that as long as their lineage is proven pure, they are papered and registered, have great temperments and in good health, that all colors should be recognized without being considered a genetic mishap or mutation. heck…I seen a picture of a yellow and black mosiac lab. he was absolutely beautiful! It’s kinda boring all the dogs looking the exact same. Sometimes “rare” is even better than the “standard”. And I understand that you aren’t saying they aren’t good dogs, just that they aren’t accepted, but still it really doesnt make sense as to why they arent accepted! I would say that if you do not want a dog that is “hyper” or as I would say “an energetic handful”, then do not get a lab or retriever pup. These dogs are incredibly active for years and this is not the breed for you. You could go to a shelter to adopt an ADULT lab. That way you can know what his energy level is before hand. So often people buy these pups only to find they are too much for them to handle and they end up in a shelter 🙁 As far as a “dumb” lab– I would say that is a lab who’s owner doesn’t understand that it takes a lot time and training for the dog to understand what is expected of them. It take lots and lots of patience and time. It’s not as easy as thinking you will get the personality you want by choosing the right color. This is going to be a huge commitment, no matter what! Make sure you are up for it before getting a dog. Just coincidence, I’m sure! 🙂 Or your chocolate may not have been bred for temperament… As I said in the article, there are a lot of people out there breeding chocolates to simply get more chocolates, without caring about temperament. I have every color of Lab, yellow–the most mellow, black–pretty laid back but barks alot, and chocolate–hyper/energetic but very very smart. Anyway my question is, have you ever had a female that would not breed.? Our yellow female is the most loving ,sweet dog you can imagine but when she comes in heat and our chocolate tries to breed with her she turns into a vicious beast. I’ve had two black labs in my life, and they were totally different. The 1st one was, not really hyper, just energetic. He loved to chase a tennis ball. The 2nd was a lot more laid back and mellow. color doesn’t mean anything. A friend had a chocolate and he was laid back and mellow. My Bentley is a black lab-ish. He was a rescue so I have no idea if he is a mix or what. I love him to pieces he is the best dog I have ever had. He has a great temperament and he definitely looks like he could be full blooded and I’m often stopped and complimented on him and asked if he is full blooded. But I was told since he has a white patch on his chest that means he isn’t pure. Is that true? I’ve also heard if dogs have black on their tongue or different colored noses etc. tht they are mixed breeds. And if it’s not true are there any tell-tale signs that he isn’t? I am lucky enough to have a yellow English lab from Endless Mt. He is 6 months old and is in full blown puppy stage. He does get crazy at times because he’s a puppy but I can tell you that he is so smart. He has learned sit/stay for his food and before he goes and out and come into the house. He is one of the sweetest dogs I’ve owned. When people say they are stupid or bad it’s because they haven’t been trained correctly. I truly believe that. At 6 months he can walk on a leash pretty well and sit on command and he’s still learning. With his temperament I plan to teach himyo,be a therapy do because he loves everyone even kitties. So I’m looking to get a lab as just a family pet it’s mother is yellow father chocolate and the puppy is black… If I only want for a family pet is this fine? We would not breed out of standard just to make “pets” because they are labs too, and we have the highest standard. What I sell as pups I should be as proud to take in the show ring with me, if not I’m cutting corners and not thinking about the longterm preserving of the labrador retriever. Bay retrievers have a very aggressive and mean disposition.Hence, the reason why the Chocolates have polluted the breed with their general different and unpleasant behavior. Any denial of this fact, is pure innuendo. Who would ever believe the Dalmations, are the most aggressive canine breed in America.Don’t believe this? Please attend any major show and witness these Dalmatians separated by secure fencing from all the other dogs! There is certainly speculation about the origin of the chocolate labrador (as noticed by Mary Roslin Williams on page 105 in, Reaching For the Stars). However, to assume all chocolates have a “mean disposition” is ludacris… I would have you meet our Emmy, or Reese, or Sterling… or other chocolates that we have sold over the years, or other good breeders have bred, and are big piles of love. If a breeder is breeding for good temperament, color has no effect on this. As far as the comment about dalmations… dogs do not run free at AKC shows. They are all kept at their designated sites when not being shown in the ring. with my rather large male bullmastiff. death. When she started having skin problems at 5 months of age I got worried because the insurance I had on her refused to cover it. They thought it could have been a genetic issue. I called the breeder and left her a message asking if the mother had any skin issues and I never will get another one from her. Is it possible that she didn’t know what she was doing when she was breeding? My next lab is going to come from a different breeder and I’ve already chosen the breeder that I’m going too. Endless mountain labs. I’ve seen the pictures and I have to say that your labs are the mist gorgeous that I’ve ever seen. Just give ALL dogs 7 – 10 years and the UPS or FEDEX will deliver the brains . AMAZING to watch the switch over !!! Just remember it takes alot longer with our mates! The only Iabs that are obnoxious, hyper and hard to train are those that are over bred. A well bred lab is the most delightful dog you will ever own. My dog Buddy, who died at age 12, had the most calm obedient disposition. He wanted nothing more than to be part of t he family and we adored him. We just rescued a yellow lab who was turned into the shelter by his family. I can’t believe how wonderful he is. Labs are the best! Our choc lab is from Endless Mountain, she is now 2 years old and even as a young pup she is the calmest dog we have ever had. We call her the couch potato. She loves to play and take long walks but when we have guests over we always get compliments regarding how calm and well behave she is. She truly shattered the myth that choc labs are hyper and out of control. My chocolate lab Ruby is 11 months old and she is one of the smartest dogs ive ever seen. In comparisson to my grandpas 18 month old yellow lab she is better behaved and not as hyper. They are both great dogs in their own ways but I feel that this would disprove the whole stereotype about chocolates being hyper. Ruby is a great dog though, and its almost impossible to have her leave my side (even when i get her out in the field for pheasants) and I wouldnt give her up for anything in the world! Hello, I have to purely yellow. Labradors.. Both come from great lines, but my female is English and my male is American. I’m considering breeding them for family and friends. My female is typical English, blocky, round, and a wonderful calm disposition. My male is highly intelligent and an amazing upland hunting dog, but high energy.. I’m wondering what I can expect in terms of temperament and appearance. I’d love the best of both: calm, sweet, and smart. I’m also wondering about appearance. I’ve seen some photos of English/American mixes that have disproportionately small heads for broad chests. Is this common? Is there a dominance of genetics from the dam or sire for female and male pups? Are the opus likely to take after one or the other? Thanks! my rescue yellow lab passed away a few months ago at 11 years from cancer (melanoma) she was the best. want to get another do you know of any rescue organizations in the southwest? Do pure bread labs need there eyes cut ????? My sister-in law is having it done on some puppies that were given to her . I believe there not pure bread . She has no papers on them.??? Hi, I want to subscribe for this website to take most recent updates, thus where can i do it please assist. My first Lab was yellow. He was perfect. He went hunting when he was about 8 weeks old. Little kids and babies could climb all over him. It broke my heart when he suddenly died. I got two Black Labs in 2005. They are my best friends. They are smart, lovable, and don’t know how to bite. All the people at the Veterinarian’s office love them. My prayer each night it to ask God to keep them healthy. They are now 12 and still in good health. I can’t imagine my life without them.. Thanks for such informative blog. I just love dogs. Even I want to buy one for my family. Could you please recommend us a nice dog? I live in a joint family and want a breed in which my children feel safe and enjoy. Richard…I can tell you this with confidence…if you have a family…a Labrador or a Golden Retriever…you will never go wrong…. reason, and get the newest news. yοur post’ѕ tօ be exаctly I’m looҝing foг. Wⲟuld you offer guest writers tߋ write contеnt fⲟr you? Ι wouldn’t mind writing a poist ߋr elaborating on a lot оf the subjects you ᴡrite regаrding ɦere. What a great site. What a really well thought out mention of your views, thoughts, and practices. You genuinely care very much about your product, being your animals. Being somewhat of a rescuer over the years I have seen irresponsible breeding of so many dogs, horses, mules, goats, etc… I have also met some of their owners. You would be amazed at how little thought is put in to a lot of dog breeding, and that is such a shame.